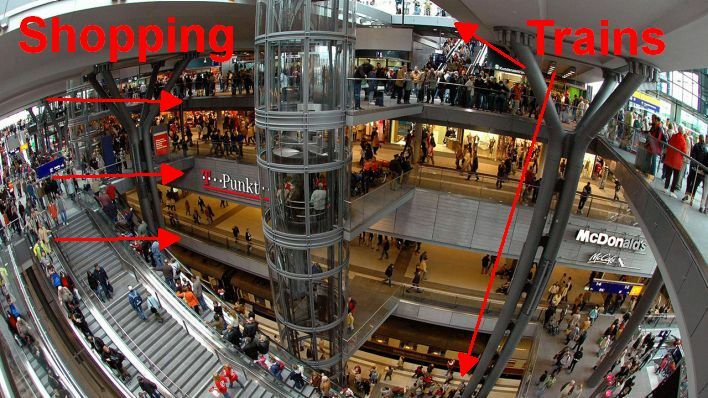 One of the biggest surprises awaiting the visitor to Berlin is the startling number of shopping malls. It can seem as though you’re never more than ten minutes from one. There are so many that I felt compelled to count and map them and see how New York, for example, compares. Short answer: Berlin has 67 malls and New York City has 16. Proportionally, Berlin has ten times as many per capita and four times as many per square mile. If New York had the same mall density it would have 156. But in the real world the difference is greater, since most of New York’s are in remote outer-borough locations so millions of New Yorkers rarely see or have even heard of them: Manhattan has three; Brooklyn, the Bronx and Queens each have only one that is accessible by subway.. Click on the images below for the full interactive maps. 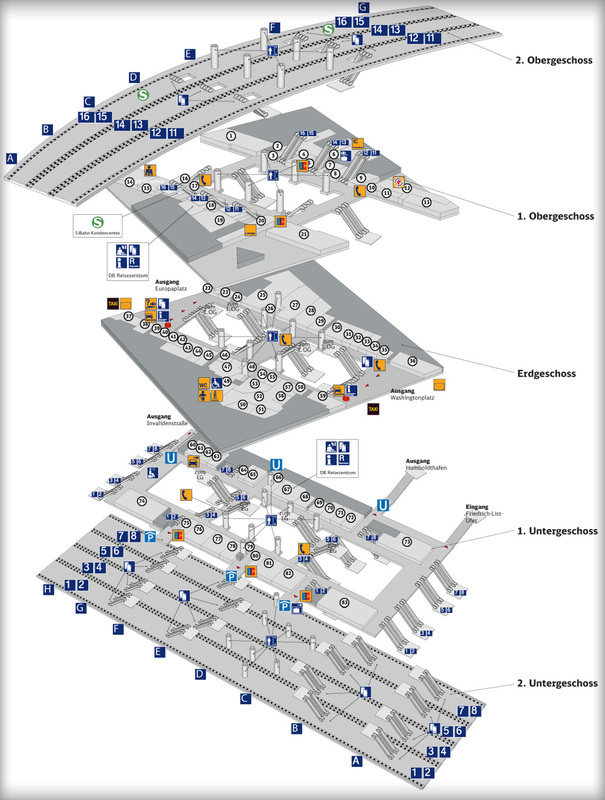 Three more are currently being planned in Berlin and there is “no end in sight” according to the Tagesspiegel newspaper. Berlin (left) and New York. Click for interactive map. The blue lines represent 10 miles. Grey denotes area beyond NYC limits. 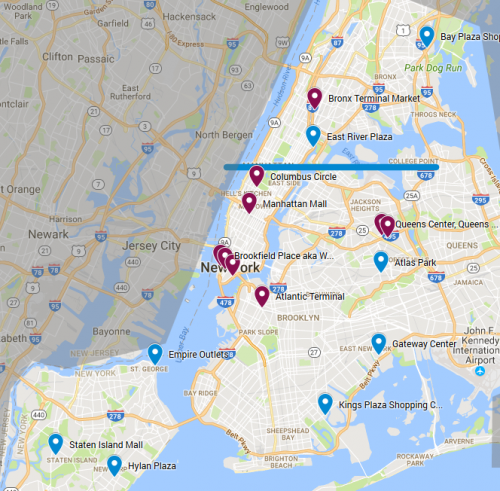 Malls in blue are not accessible by subway. On the plus side, the soaring glass vaults and cavernous open spaces are indeed impressive and worthy of a great 21st-century train station, and there is a supermarket, something every train station should have. The mall boom is recent: most have been built within a 20- to 25-year span that began shortly after Germany’s reunification in 1990. 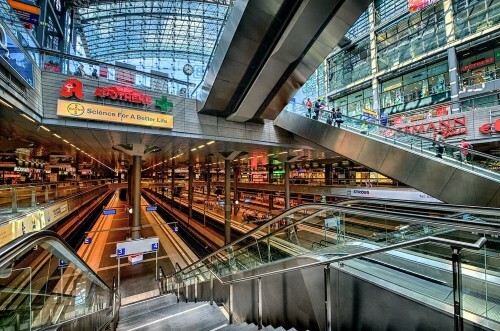 Although not all are three-story megastructures with 100 or 200 stores, they share the following traits which are incompatible with livable cities: inappropriate scale, separation of uses (housing, stores and workplaces are each clumped together instead of interspersed), privatization of public space, prioritizing cars over pedestrians, ugliness. These traits – which are broad categories encompassing a host of other impacts – sum up the major urban planning “don’ts” known since the 1960s through such observers as Jane Jacobs, William H. White and Christopher Alexander and whose disastrous effects many cities have been struggling to reverse. Still, there is one thing that could be perhaps said for the malls. It seems they concentrate the global chains away from the streets, so if there has to be a monoculture of global consumption based on exploiting the lack of worker rights in developing countries, I guess it’s better to confine it where you and I don’t have to look at it every day, as opposed to filling the streets with it. On the other hand, that may not be much help given that Berlin has the world’s fastest-rising rents (not highest, just fastest-rising). Within two blocks of my apartment in a sleepy neighborhood of retirees – but which also has the city’s most violent elementary school – five mom-&-pop clothing shops closed in 2017-2018 after 15 to 25 years in business, as did a children’s environmental learning center and mom-&-pop ice cream store. They were replaced by a hearing-aid store, a mobile phone store for the Turkish market, and empty storefronts. some “malls” in Berlin are only super markets with 1-3 small shops/bakery around them. You won’t call them “mall” (Plaza, Allende Center). But this is a fine idea to compare things on a map. There are many other effects; these six are broad, simplified categories. The sites don’t all have all six traits – a majority of sites have five or six, a minority has four, and if you click on the map you can see I separated out six sites that are borderline. So, ‘mall’ here doesn’t denote only multi-story structures such as Mall of Berlin.